Azusa Pacific’s Bachelor of Fine Arts in Acting for the Stage and Screen is one of the first programs in the country to train actors for equal excellence in on-camera and stage acting. APU’s BFA program, located just 26 miles from Los Angeles, the entertainment capital of the world, is an innovative acting degree providing real-world connections, professional on-camera credits, and an industry showcase of film and live performances for seniors. 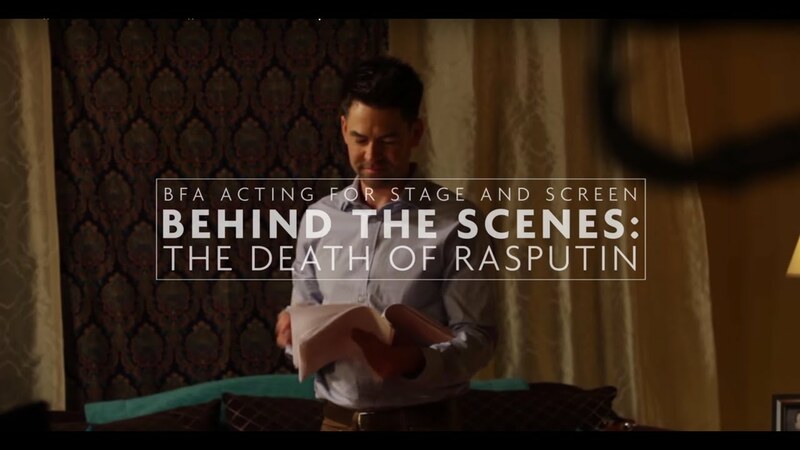 Go behind the scenes with Azusa Pacific BFA students on their film project, The Death of Rasputin. APU‘s BFA in Acting for the Stage and Screen was named one of the top 25 programs in the nation for 2018-19 by OnStage Blog. Is the BFA Right for You? This 63-unit BFA program is designed for students who would like to act professionally in theater, film, and television. Azusa Pacific’s proximity to Los Angeles provides students opportunities to be taught and directed by professional actors and directors. In the fourth year of training, seniors act in a high-quality film with a professional director and production team. The students then participate in an industry screening in Los Angeles, ensuring that they graduate the BFA program with relevant experience, connections, and a professional reel. All prospective BFA students must audition for the program. For students who wish to explore a career in theater outside of acting, Azusa Pacific University also offers a Theater Arts major (B.A.). Mark your calendars for the Senior Showcase on April 9, 2019, featuring Azusa Pacific seniors graduating with a Bachelor of Fine Arts in Acting for the Stage and Screen. Click the button below for more details and meet the graduating class.